(Phys.org) —Linda Manzanilla, an anthropologist with Universidad Nacional Autónoma de México has published a paper in Proceedings of the National Academy of Sciences, offering a possible explanation for the collapse of the early central Mexican city of Teotihuacan—she believes it was due to clashes between groups with differing economic interests. The ruins of Teotihuacan can be seen today at a location approximately 30 miles northeast of modern Mexico City, and offer testament to the flourishing metropolis that once was home to approximately 125,000 people, making it the most populous city in the pre-Columbia Americas. The city got its start around 100 BCE, but was completely decimated by the eighth century. Why it collapsed has been a subject of debate among historians and anthropologists for several years. In this new effort, Manzanilla suggests it was not drought or invaders that brought down the great city, but internal strife among its inhabitants. 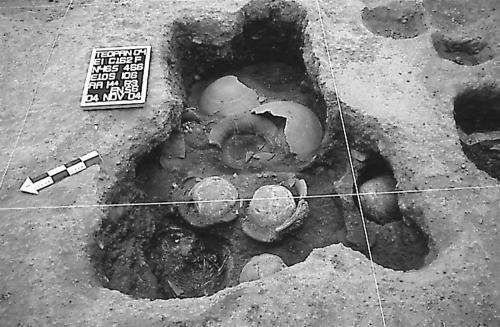 Manzanilla is basing her claims on her examination of parts of the ruins, along with an analysis of human remains and other artifacts that have been found in the area. She suggests that because of volcanic eruptions in the first and fourth centuries, people were forced to move from the southern basin, and wound up in Teotihuacan, which resulted in a mix of ethnicities. Activity markers, nutritional patterns, isotopes and ancient DNA analysis showed that the immigrants (some of whom brought specialized skills along with them) tended to live on the outskirts of the city in different neighborhoods and were given specific jobs by businessmen that helped to bolster the economy. But it also led to rivalries between the neighborhoods. As time passed, she believes that tensions arose between wealthy businessmen, neighborhood leaders and those that were part of the government. The tension was increased, she claims, by the government insisting on retaining control of all natural resources. Eventually, that tension boiled over and the result was an angry mob of people burning down major parts (administration and ritual buildings) of the city and trashing sculptures and other iconic structures, and eventually to total collapse of the city. She reports that thus far, no evidence of a foreign invasion of any type has been found. In this paper, I address the case of a corporate society in Central Mexico. After volcanic eruptions triggered population displacements in the southern Basin of Mexico during the first and fourth centuries A.D., Teotihuacan became a multiethnic settlement. Groups from different backgrounds settled primarily on the periphery of the metropolis; nevertheless, around the core, intermediate elites actively fostered the movement of sumptuary goods and the arrival of workers from diverse homelands for a range of specialized tasks. Some of these skilled craftsmen acquired status and perhaps economic power as a result of the dynamic competition among neighborhoods to display the most lavish sumptuary goods, as well as to manufacture specific symbols of identity that distinguished one neighborhood from another, such as elaborate garments and headdresses. Cotton attire worn by the Teotihuacan elite may have been one of the goods that granted economic importance to neighborhood centers such as Teopancazco, a compound that displayed strong ties to the Gulf Coast where cotton cloth was made. The ruling elite controlled raw materials that came from afar whereas the intermediate elite may have been more active in providing other sumptuary goods: pigments, cosmetics, slate, greenstone, travertine, and foreign pottery. The contrast between the corporate organization at the base and top of Teotihuacan society and the exclusionary organization of the neighborhoods headed by the highly competitive intermediate elite introduced tensions that set the stage for Teotihuacan's collapse. Too bad she did not take the AGW Cult's scaremongering route and so I hope she has planned for the sudden drought that will hit her funding. The speculation shows a strong flavor of current events, with an apocalyptic aura: "The tension was increased, she claims, by the government insisting on retaining control of all natural resources. Eventually, that tension boiled over and the result was an angry mob of people burning down major parts (administration and ritual buildings) of the city and trashing sculptures and other iconic structures, and eventually to total collapse of the city." Perhaps they rebelled against their priests/nobility. That's pretty much what she is saying in the report.